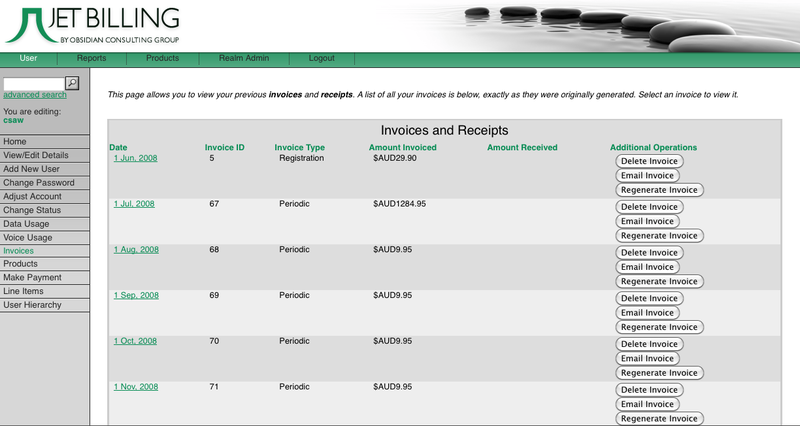 The Invoices tool (Figure 35) allows end-users to view summary information about their invoice history. It also allows them to view a stored copy of any actual invoices that they have received. When selected, the operator is presented with a list of issued invoices and options for each associated invoice. Email Invoice – If a user has an email address specified in their account details then this option will send the invoice to that address. When an operator clicks on the link for the invoice date, their web browser will either display the PDF statement in-line, or will launch the associated application (usually Adobe Acrobat Reader) to view the file.